Elements Applied: Leaves and root are the commonly applied elements. Used for: The plant is commonly applied for fighting bacterial infections and viruses. The leaves are specially used for reducing fevers, while the root is applied to kill parasites. Isatis leaves are commonly applied for conditions associated with fevers, commonly of epidemical character. Commonly, both roots and leaves are applied for infectious conditions, like mumps. Although the herb produces a relatively strong effect on the system, it’s absolutely safe to apply for fevers by any category of patients. Due to the fact that there are few herbs which are applied for infections in traditional western medicine, this plant has gained great popularity due to its capacity to treat viral infections. This plant is particularly useful in treating lung inflammations and conditions, as well as skin diseases, associated with blotches or rashes. Isatis root is highly valued for its antibacterial properties. Due to this reason the plant is applied for a set of conditions, induced by microorganisms, like mumps and other epidemical conditions, sore throats, flu, and habitual colds. 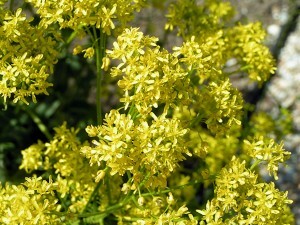 It is used to reduce fevers and is believed to be effective in treating jaundice. Additional Info: The herb is valued in Ayurveda and Chinese medicine, but nowadays it’s gradually gaining its popularity in the west. Preparation and Intake: The common dose for leaf extract is 10 grams on average. The root should be taken in a dose of 20 grams on average. Safety: Warning! Isatis is not recommended to use for a prolonged period in case of stomach or spleen deficiency. The herb should be avoided in case of general weakness.